A Georgia college has banned Nike from its school store, and a Louisiana mayor tried to ban the brand at city rec centers. Nike’s new ad campaign featuring Colin Kaepernick sparked outrage among his critics, several of whom demanded a boycott of the brand and took to social media to share pictures of themselves burning its products. In 2016, Kaepernick, then a member of the San Francisco 49ers, kneeled during the national anthem to draw attention to police killings in communities of color, a protest that critics (including Donald Trump) claimed was unpatriotic. 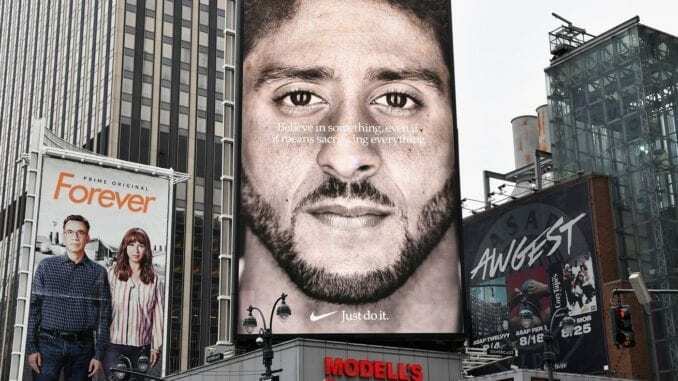 By featuring Kaepernick in its campaign, Nike has positioned itself as an ally to him and, by extension, to the Black Lives Matter movement that shares his stance on policing. While overall the Kaepernick ad has been a success for Nike — sales jumped by 31 percent shortly after the new campaign debuted — some officials are taking their displeasure with it beyond sneaker burning, with troubling implications. Lawmakers and university officials in states like Louisiana, Tennessee, Georgia, and Missouri are trying to use their influence to get constituencies and colleges to sever ties with Nike. It’s a trend that has led to outcry from the public, civil liberties groups, and legislators with opposing viewpoints. Late Wednesday, Zahn rescinded the new rule after the American Civil Liberties Union warned him that it was unconstitutional — but not before his memo had been shared thousands of times on Twitter and sparked a public protest, in which members of the New Orleans Saints participated. Other Louisiana lawmakers criticized the policy as well. In a Facebook post, Kenner City Council member Gregory Carroll called Zahn’s memo “disturbing” and said the mayor issued it without his input. And in a statement rebuking the Nike ban, Democratic Louisiana Rep. Cedric Richmond noted that the company donated more than $10 million to the state after Hurricane Katrina and that Louisiana faces problems far more serious than Nike’s Kaepernick-led campaign, including one of the nation’s highest infant mortality rates and one of the poorest educational and health care systems. One Tennessee military veteran told a local TV station that although he doesn’t support Kaepernick, he doesn’t believe Tennessee schools should sever their contracts with Nike because of the company’s ad. But Watson has supporters, including fellow Republican state Sen. Todd Gardenhire, who speculated that the athletic wear company just might have to revise its agreements to maintain its contracts with Tennessee schools. In their rush to undercut Nike in light of its support of Kaepernick, however, these legislators have seemingly overlooked that in 2015, the corporation opened its largest distribution center in Memphis. Danny D. Glover, the senior political director of Nashville Mayor Karl Dean’s gubernatorial campaign, pointed out the fact in a viral tweet with the hashtag #YouAreHurtingTennesseans. The concern isn’t just that Nike employs thousands of Tennesseans but that these legislators are behaving as if all constituents share their views on Kaepernick. College campuses are often portrayed as places with a free exchange of ideas, but two private Christian colleges have taken actions that make it clear that they oppose not only Kaepernick’s viewpoints on police brutality but Nike for using him in its ad. The College of the Ozarks in Point Lookout, Missouri, is removing all Nike logo uniforms. The move is consistent with the school’s announcement last year that it would refuse to play against teams with members who kneel, sit, or turn their backs as the national anthem plays. Davis’s statement ignores that numerous service members have expressed support for Kaepernick and that some veterans have been killed by police. It also overlooks that freedom of expression, even expression one finds offensive, is one of the nation’s founding principles. The college will sell all of its current Nike inventory and not restock it. Afterward, students and staffers who disagree with Caner must leave the TMU campus to buy Nike goods. While Caner surely has supporters, his detractors, including TMU students and alumni, have voiced their disapproval with his decision. As an alumni and donor, you won’t be seeing anymore of my money. Not just because of this, but because you are stuck in 1940. So sorry to cut ties with a place I had so much fun of. Some have called Caner’s announcement a publicity stunt because the 2,600-student school had already signed a deal with Adidas. And others have said they simply support Nike and enjoy its products. Caner has acknowledged that some TMU students disagree with him. But his comments on the controversy reveal that he’s yet to separate his personal views from TMU as a whole.